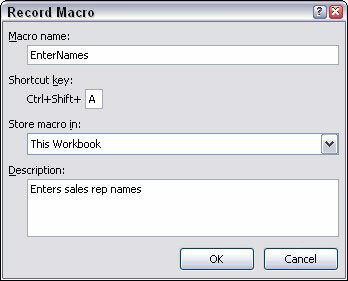 You can use macros in Excel 2007 to save time by automating tasks that you perform frequently. A macro is a series of commands grouped together that you can run whenever you need to perform the task. Click the Office button and then click the Excel Options button. From the Popular section, select the Show Developer Tab in the Ribbon check box. 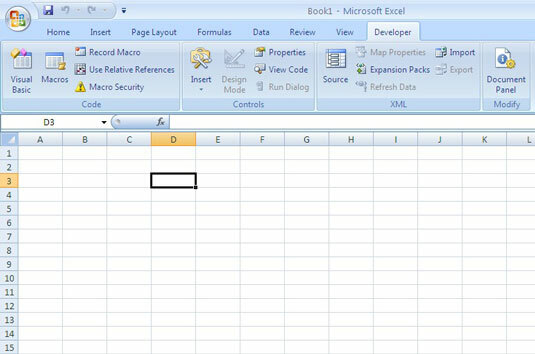 Display the Developer tab to work with macros in Excel 2007. Personal Macro Workbook: Choose this option if you want the macro to be available whenever you use Excel, regardless of which workbook you’re using. Excel records your steps exactly — such as (Select cell C3) — but you can also record the steps relative to any current cell — such as (Go up one row and insert a blank line). To do so, click the Relative References button on the Developer tab. You can turn the Relative References feature on and off as needed while recording the macro. The macro recorder stops recording keystrokes, and the macro is complete.